October 17, 2015, 7:18 p.m.
Democrats cheered when Bernie Sanders Hillary Clinton’s use of private email as Secretary of State at the Democratic primary debate. But many non-Democrats are also tired of hearing about Clinton’s “damn emails”, according to a new YouGov poll. 57% of adults believe it is probably true that "the American people are sick and tired of hearing about (Hillary Clinton’s) damn e-mails". 30% disagree, while 13% are unsure. Unsurprisingly, Democrats overwhelmingly suspect “the American people” are ready to move on from the email story, which has dogged Clinton’s campaign for months. 82% agree with Sanders. Yet half (51%) of independents and two-fifths (38%) of Republicans also think the senator from Vermont is on to something. According to the poll, 61% of Americans have heard “a lot” about the Clinton email story. And asked whether they personally believe the story is getting too much attention from the media, 48% say it is, versus 25% who want the media to talk about it more (only 15% believe the media is getting the balance right). Socialism remains less popular than capitalism in the United States: only 25% of adults have a favorable opinion of it, while 48% view capitalism positively. Among Democrats, however, the balance is flipped, with 49% favorable to socialism compared to 37% for capitalism. In May, capitalism and socialism were tied at 43% favorable. What’s more, more Democrats say Sanders’ “democratic socialist” label makes them more likely to support him (20%) than say it would turn them away (6%). But do Americans really think in terms of these labels? Re-imagining Cooper’s question to Sanders, respondents were asked if they consider themselves to be capitalists, socialists, or neither. Capitalists outnumber socialists by three-to-one (30% to 9%) overall, but the majority say neither (46%) or “Not sure” (15%). 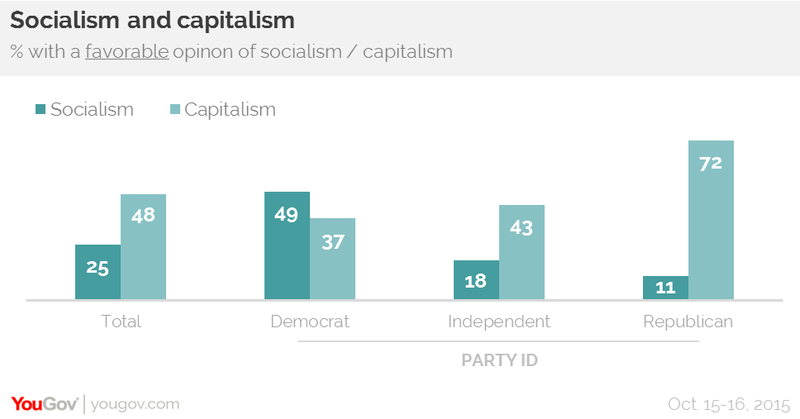 Most independents and most Democrats are in neither the "socialist" nor the "capitalist" camp (though 21% identify as socialists, versus 14% as capitalists). Most Republicans (57%), however, call themselves capitalists. Clinton’s well-received performance at the debate (most Democrats watching say she won) has led some to wonder if Vice President Joe Biden still has room to enter the nomination contest. 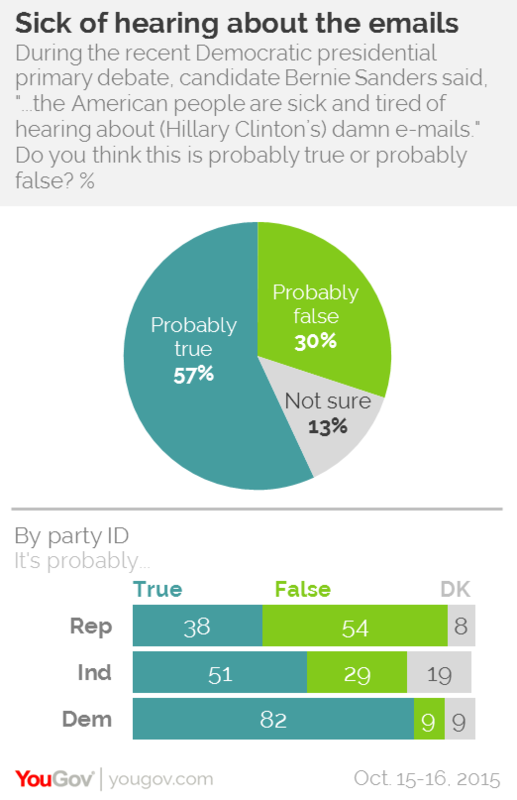 The American public is more doubtful than before. 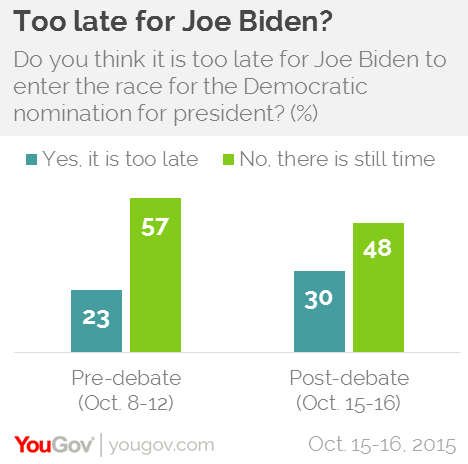 Last weekend, 57% of Americans said Biden still had time to decide about a run. Post-debate, the share who say it’s too late has risen seven points to 30%, and the share who say he has time has fallen nine points to 48%. Among Democrats specifically there is a slightly smaller shift in the same direction.